One of the best things about my Stampin' Up! "job", is the people you meet. I love my customers and definitely love and appreciate my downline. We get together on a regular basis and today we are having a Shoe Box Swap. This is simply a day where my downline gets together and we stamp. A SBS (shoe box swap) is basically a potluck card class. Each participant creates a card and brings the project prepped for the number of participants. 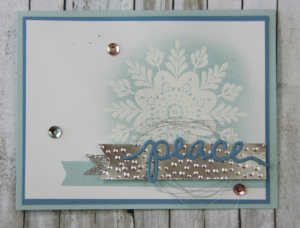 Each participant creates all the projects and goes home with a bunch of awesome card samples. Could it be any more fun? Maybe with a little chocolate but that's it! Totally fun. Have you considered becoming a demonstrator? Think about it…do you like a discount? 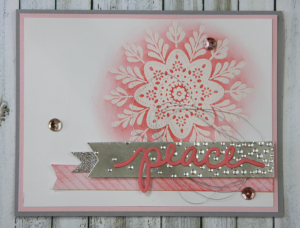 How about a 20-25% discount on any of your stamping supplies? And a really fun group to stamp with? Contact me for more information…whether you just want to enjoy a discount or make this a career, Stampin' Up! can be the Perfect Fit. Perhaps you are more non-traditional and prefer it in pink? As in cards, variety is the spice of life. Becoming a Stampin' Up! demonstrator, regardless of the reason for joining (ie, enjoying a discount, a little spending money, a fun group to hang with) can be "perfect". Give it a try, what do you have to lose? Beautiful cards! I would love to share this on my blog for ‘My Crafty Friends Monday’ (a round up of amazing cards from amazing stampers!)! Please let me know if you would prefer that I didn’t share it (of course I give you credit and link back to your blog! ).